The settlement of the publisher and the advertiser is separated in AdServer. The account of the user takes place automatically each month First for the previous month. Although sales value, but the final statement is made at the first of the month appear in the statistics already for every day. Here, the sales for the previous month are added up and creates a settlement that can see in his log-in area of ​​the user. Revenue is credited to the virtual user account, that it shall be reserved for the payment. The user can at any time in the login at his account balance. Depending on the setting of the system the collected Good Have the user on reaching a certain amount (eg 25 EUR) will be paid. For this purpose, (also the first of the month) creates a credit, which is also downloadable in the user area. Is a payment to the publisher makes the network operator / AdServer operator. 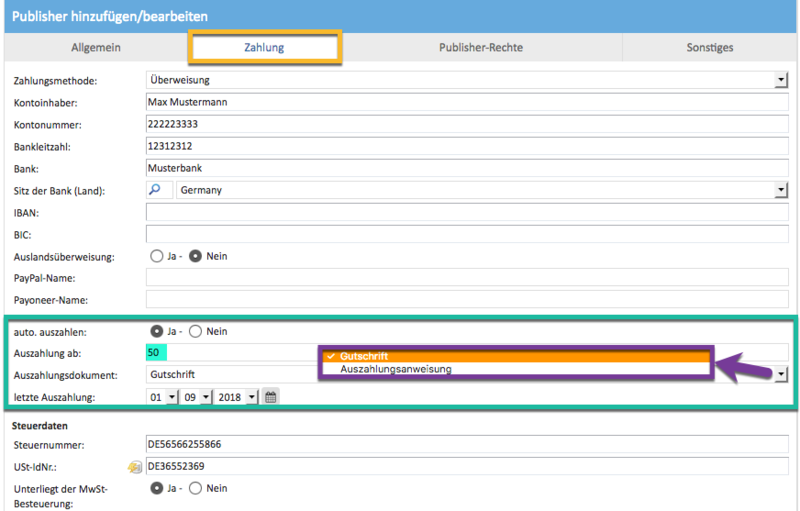 Is information for the publisher that he can provide an invoice to the ad server operators / should. The billing of customers is a little different, because it assumes the set account type. You have the option to your customers to create the type prepaid. Here is assumed prepayment. That is, the customer is sent a bill for charging your account over a certain amount about the system. Is the money arrived to book it (manual) on the customer's account (Customer list -> click on the account balance). The client's campaigns are then settled daily and the converted amount deducted from the account. If the account to 0, all of the campaigns are stopped. The customer, the account must now re-charge (of course this also happened before already) If the campaigns were stopped, they need to be restarted. For customers whose account is marked with the type of post-paid, the settlement of the campaigns is not automatically done, but it must be an invoice manually (either before or after the campaign). Unlike pre-paid customers, the customer does not have to be charged here. Therefore, the campaigns can not be stopped Due balance setting.